Please read these guidelines for determining if your logo is appropriate for engraving using the recommended file formats for custom engraving. All points in file must be editable. See top photo shown with view when selected in Illustrator. Third photo shows engraved results. Type: Convert all text to outlines (Type > Create Outlines) as we may not have your font on our computer. Outline Images: Please convert logo to "Outline" before sending to us. Simple File Format: Save file in Illustrator version 11.0 or older. (We will ultimately be converting it to Illustrator v3.0.) To do so: Select export file, select legacy EPS file, save. In the Legacy EPS Options box, select version 11.0 or older, and Tiff Black and White for the preview. Unusable File Formats: In order to engrave a logo, the computer must be able to read every point in it. Rasterized images like .bmp, .tiff, .jpg, bmp, gif, or .pdf (or converted .eps) files will NOT work because they are more like photos - just one large image. See second photo at left with view when selected in Illustrator. We need unconverted vector based artwork files that can be edited on a point by point basis. To illustrate the difference, imagine trying to edit a Word document. One version is supplied in the .doc file format and another is a photograph of the document. There is no way to edit the text in a photograph without retyping (or scanning in and proofing) the whole file. 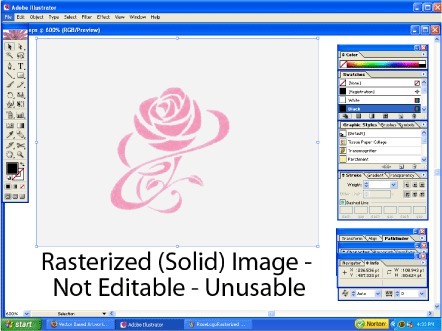 No Rasterized Files: No .png, .bmp, .tiff, .jpg, .psd or .pdf files. No .eps files that have only been converted from the aforementioned file formats. 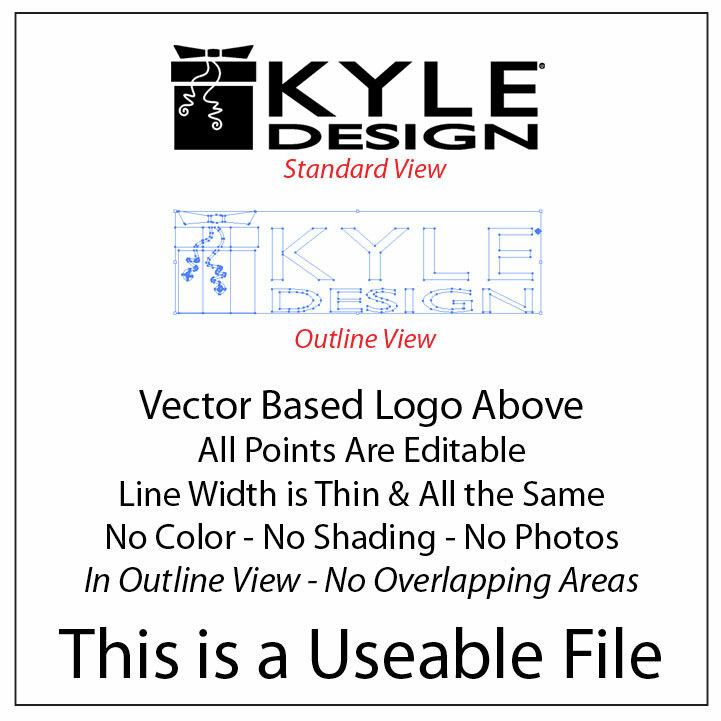 Vector based file format required - every point must be editable or the engraver cannot read it. No Photographs: Photographs cannot be engraved. No Shadows: Images cannot have any shadows/drop shadows, halftone or grayscale areas. No Color: Any colors will be converted to black and white line work. No Thick Lines: Any line work must be converted to an "outlined path" as engraver has only one line width. So a heavy weight line will still only appear as a narrow line when engraved. We recommend converting artwork to a thin line width such as .5 pt. for a more accurate representation. No Open Forms for Hatch Fill Areas: Any areas that you wish to be hatch-filled must be closed forms (no open end points or gaps in the outside line). Hatch-filling is the technique whereby lines are engraved very close together to give the impression of a different texture/color. No Overlappping Areas: Once converted to line work, shapes that cross over each other will show intersecting lines, unless original has been modified to remove them. No Layers: All line work must be on one layer or it will corrupt the file. BEST FORMATS: A black and white file format works best. Images cannot have drop shadows, shading, or photos images in the background. We recommend contacting a graphic artist to prepare your logo for you if it contains such elements. Once the logo (this includes any text that goes with it) is clean, we can then send it to the engraving software for sizing and layout. The bottom line is that it is much faster and cheaper to ask the original graphic artist to provide a crisp black and white line art image in an editable .ai (Adobe Illustrator - preferred), .eps (Encapsulated Postscript) or .cd (Corel Draw) file format whenever possible. Bitmap or .jpeg images saved in those file formats still don't work - they must be editable. Even .eps files can be in a format where it is just a converted rasterized image (one big locked image). Important: Open the file in Illustrator or Corel Draw first and BE SURE that you can individually select any point or line within the image first before sending it to us. Solid Areas in Logo: If you have large solid color areas that you need filled with texture, this would be done with "hatch filling". This will be a series of close-together lines and it is best for large areas and requires more time to engrave so there is an extra charge for hatch-filled logos. it is generally unnecessary to fill small areas or text with hatch filling. Add your business or organization's logo to a quality, polished silver business card case.